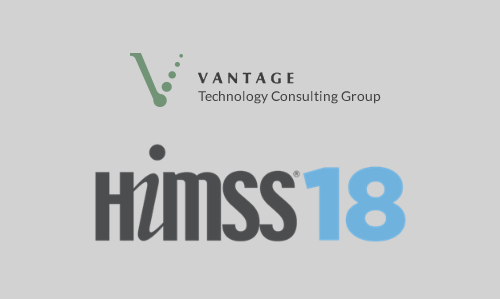 The Healthcare Information and Management Systems Society (HIMSS) is a global voice, advisor and thought leader of health information and technology. One of the highlights of the year is the annual HIMSS conference which brings together more than 40,000 health IT professionals. A team from Vantage was at the conference this year, and here are their key insights and observations. My 4 take-aways from the conference included: The Cloud+Blockchain, Selfies for Healthcare, RTLS going BLE and the Floor as the new Frontier. Almost everything is moving to the Cloud, and most of the solutions are very compelling. There were also many blockchain solutions at the conference, and I was intrigued how blockchain could enable secure sharing of healthcare data across networks and automate transactions through smart contracts. For more on blockchain in the healthcare industry, check out the HIMSS Blockchain Work Group blog post. Selfies for healthcare is a solution that merges artificial intelligence and machine learning with “selfie” pictures to monitor and diagnose health conditions. By comparing normal selfie pictures to selfie pictures of people with different ailments, the solution can provide early diagnosis of certain medical issues. Real Time Location Service Systems (RTLS) have traditionally used RFID tags to passively or actively track assets and personnel in hospitals. One of the trends getting a lot of traction at the conference were solutions using Bluetooth Low Energy (BLE) which work by sending out a signal that can be picked up by other Bluetooth devices with an accuracy to within 3 meters. Due to the widespread adoption of the Bluetooth standard, BLE solutions are cheaper and easier to integrate into other systems and everyday devices. The final interesting technology I saw was using the floor to identify actions and respond to abnormal events. Using sensors embedded in a floor, the system can detect normal activities like walking versus abnormal actions like falling. When an abnormal action takes place, the system can trigger an event so appropriate action or intervention can take place. I was intrigued by devices that track patient vitals in real time, such as temperature, respiratory rate, hear rate, oxygen saturation and blood pressure. While I thought this technology was Best in Show, the current solutions are still not good enough. The wearable technology is still too bulky and cumbersome to be truly useful, but large strides have been made in the technology in the last year or two. One of the biggest challenges in digital blood pressure monitor is that while digital is the most wearable technology, it is the least accurate compared to brachial and radial methods. The two best solutions that I saw were an augmented reality solution from Novarad Imaging and a patient experience designer from Orbita. Novarad was demoing their solution that layers a 3D CT scan directly onto a patient’s body so a doctor can literally ‘see’ inside a patient using augmented reality googles. This brings diagnostic studies out of the dark room and into operating rooms and doctor’s offices. Orbita is transforming digital healthcare through the power of conversation. Their Experience Designer allows non-technical users easily build voice assistant applications through a simple drag-and-drop interface. These applications can then be deployed to Amazon Alexa, Google Assistant and other voice services. There was a lot of excitement and energy around Amazon, Apple and Uber entering the Healthcare market and it’s driving Healthcare organizations to pay even more attention to innovation and changes in technology. I was intrigued by many solutions using Artificial Intelligence and Machine Learning to do things like predictive analytics, automating scheduling and providing clinical decision support. SAP demonstrated a solution that improved nurse scheduling using an advanced analytics platform that provided real time actionable data to operational leaders of a 40-hospital system which increased efficiencies and saved the organization 4.3M in operational expenses in one year alone. IBM Watson’s Clinical Decision Support is allowing Physicians to access Watson’s computing power to provide information to help Physicians make better decisions in real time. Another exciting advancement was Epic, one of the largest Electronic Medical Record vendors, integrating a Virtual Assistant system that uses natural language processing and artificial intelligence to further streamline workflows for nurses and physicians and save administrative time by allowing user to optimize their interactions with the EMR by utilizing their voice. Vantage is driving the strategic and technology vision behind the next generation of healthcare and medical centers. We have a comprehensive understanding of how technology can be applied to support workflow processes and enhance patient care through strategic technology planning, system design, technology project management and transition planning.